Access to safe and appealing drinking water in child care centers and schools is a key strategy to build healthy habits that children will use for life to maintain a healthy body weight and to support overall health. This study sought to identify and summarize state-level policies in twenty states for drinking water quality and access in public schools and licensed child care centers. This information was then used to generate individual state profiles and general policy recommendations to achieve increased drinking water consumption by children and to ensure drinking water is safe and appealing. The guiding principles behind these policy recommendations are to ensure that safe, potable drinking water is made available at no cost to children throughout the day. 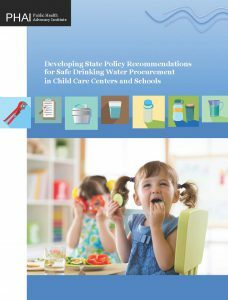 The state profiles and policy recommendations can be used to assess current policies for drinking water access and quality and to determine which policy recommendations are relevant to the needs of a particular state’s schools and child care centers. The state profiles and policy recommendations also can be used as points of comparison and sources of ideas during the policymaking process. This work was supported by Healthy Eating Research, a national program of the Robert Wood Johnson Foundation.